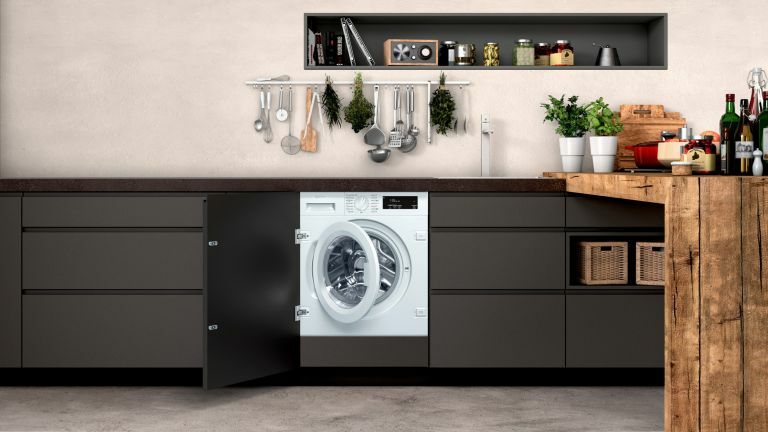 If you're not a fan of having your large appliances on show, you might be on the hunt for an integrated washing machine, which can offer a sleek, seamless look when worked into a kitchen or utility room. What is the best integrated washing machine? Our top recommendation, when it comes to choosing the best integrated washing machine, is the Indesit EcoTime IWME147 Integrated Washing Machine, thanks to its silent technology and value for money. Ideal for an open-plan kitchen-diner or flat with thin walls, a low decibel design means you won't be disturbed by this model. On top of that, it offers a decent energy rating and high speed spin, as well as a variety of specialist programmes catering for everything from silk and curtains to shoes. When it comes to buying the best integrated washing machine for your lifestyle, it's worth bearing the following factors in mind. If your laundry day seems to come more frequently than most, keep an eye out for time-saving options such as quick wash cycles and a timer delay to take advantage of cheaper electricity tariffs. Do make sure you measure up the space allotted for the new model carefully however and check against the dimensions of your chosen design before you buy. Even a few millimetres can make a huge difference as to whether it will fit. Large capacity drums that can cope easily with a bigger load are perfect for families, particularly as larger loads mean more washing, less often. Think about the type of clothes you wash regularly and whether you’d benefit from specialist cycles for things like sportswear, delicates, woollens, school uniforms and large, heavy items such as duvets and curtains. Thanks to its silent technology, this integrated appliance is ideal for open-plan kitchen-diners. With a decent energy rating and high spin speed, it’s a good value model with a variety of specialist programmes such as Silk and Curtains as well as Shoes and an easy iron option. A timer delay allows you to set the wash at a time that suits you while LED programme progress indicators keep you informed of the cycle’s progress. Users also appreciate the overflow device, which gives peace of mind if you’re doing a cycle overnight. Added benefits include a child lock, delicate wash, hand wash and a quick cycle. Ideal for open-plan living, this Neff model has a decent sized drum and a quiet cycle and spin thanks to the ecoSilence drive so it shouldn’t distract from conversation if you run it during mealtimes. Users love the addition of a 15-minute cycle as well as the anti-allergy programme that is said to get rid of 99.9 per cent of allergens including dust mites and pollen. There are plenty of standard programmes too, including Cotton, Delicate, Half Load, Silk Wash and Wool and all the programmes can be changed to eco or a quick cycle. Worth spending more on for the flexibility of this one. This fully integrated model has a large porthole door for easy loading and unloading and a durable stainless steel drum. The 7kg capacity may not suit larger households but otherwise this is a great little number and many users invest in the Smeg name to complement other Smeg appliances in their kitchen. There’s an easy-to-navigate electronic display that shows duration of cycle as well as a delay timer that lets you put the wash on at a time that suits you, including overnight cycles for cheaper electricity. You’ll also have peace of mind with the full anti-flood device and benefit from a range of programmes including a speedy 15-minute wash, hand wash option, sport and wool. Complete with One Touch Technology, the handy Hoover HBWM 914DC-80 Washing Machine can be controlled, monitored and managed via an app, making it easier than ever before to keep on top of your washing from any location. Fully integrated, this 9kg washing machine is ideal for families and has the added benefit of a superb A+++ energy rating, meaning users will save energy (as well as money on bills). This is enhanced by the addition of intelligent sensor technology, which weighs laundry prior to washing, adjusting cycle time, water and electricity to suit. A good sized drum means this budget model is a great option for families as well as those looking for a quick replacement when their current machine breaks down. It’s also super energy efficient, so running costs will be lower and users love the fact you can do a full load in just 28 minutes. There’s also a 2kg programme that’s done in only 14 minutes as well as quiet operation, smart LED display and height adjustable back feet that can be altered from the front of the appliance, which makes it easy to slot in. Looking for more washing machine advice?